Today is Giving Tuesday, a day recognized around the world as a time to give back and celebrate philanthropy of all kinds. 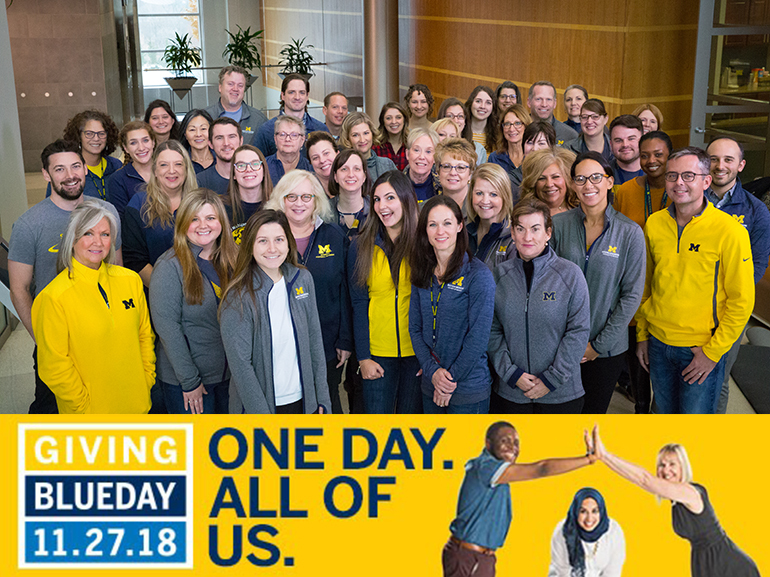 On this day, the community of faculty, alumni, students, patients, staff and friends at U-M can maximize its impact and support everything it loves about U-M by taking part in Giving Blueday. Together, the community is striving to reach a goal of 10,000 gifts. Whether you’re supporting research, care for a loved one or the physicians of tomorrow, you can truly make a difference at Michigan Medicine. Gifts of every size are helpful — and your gift could go even further through special donor and social media challenges that multiply impact. Consider giving to one of Michigan Medicine’s funds, or any U-M cause or program that aligns with your passions. Give a gift: Make a gift to support your favorite cause within Michigan Medicine, or elsewhere at U-M. Spread the word: Give your social media accounts a #GivingBlueday makeover. Share images on Facebook, Twitter and Instagram throughout the day. Thank a friend: Post to social media using #GivingBlueday and recognize a health care professional, or give a shout-out to a friend or community member who gave a gift to U-M. Follow along: The Giving Blueday team will be highlighting milestones throughout the day. Search #GivingBlueday on social media channels to keep up. Your gift today will have an impact for years to come. What will you do in one day? Visit givingblueday.org to give now, get images to share on social media and learn more. Thank you for all you do today — and every day — at Michigan Medicine.